All expectant parents have concerns about the health and happiness of their baby. In the run up to the birth, parents focus on buying everything from cots through to nappies but one of the last elements to happen is usually the decoration of the nursery. With many being too superstitious to do this very far in advance, time is often short when it comes to decorating, especially with such an important deadline looming, not to mention one which could happen early! One factor that is vitally important for both you and you’re baby and that is often overlooked is soundproofing walls. Why Does the Nursery Need Soundproofing? Sleep is an important part of the growth and development of your baby and, as any new parent will tell you, routine is vital – especially when it comes to sleeping. For unsettled babies, it can often take parents hours to get them to sleep. After rocking and singing and tiptoeing out of the room, the last thing you want is for a loud noise outside or next door to wake them up – starting the entire process all over again. Soundproofing walls is therefore really important in not only ensuring that your baby has a good sleep but that you do too. After all you’re going to need all your energy to keep up with the constant demands of the new addition to your household. DIY soundproofing is now a far cry for the egg-boxed walls of the 70s. Many companies now produce specially designed sound proof wallpapers which are easy to apply and perfectly suitable for use in a Nursery. Soundproof wallpaper is made up of a series of layers. The first is usually a layer of lining paper and is the section you apply paste to. This is followed by a layer of foam which varies in thickness depending on the brand of soundproof wallpaper you use – Saarpor Latex Sound Proof Wallpaper for example is 5mm thick. The wallpaper is then finished with a thick lining paper which can then be either painted or wallpapered over. It is the foam layer that helps with soundproofing. It effectively blocks external noise from penetrating the room whether its background traffic noise, a television set in the other room or just noise from neighbours. Which Walls Should It Be Applied To? Ideally you should apply sound proof wallpaper like Saarpor Sound Proof Insulating Liner to all the walls in the Nursery ensuring that both external noise and the noise from inside your home are blocked out. This will ensure that your baby isn’t disturbed by unavoidable things like flushing the toilet or opening the front room. 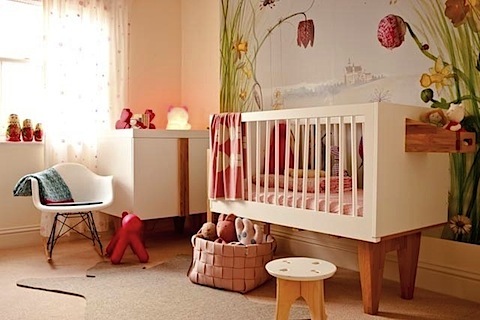 So when you are considering decorating the Nursery ready for your baby’s arrival, make sure that you not only consider the colour and the layout of the room but also the fundamentals like sound proofing for an all-round more enjoyable childhood.